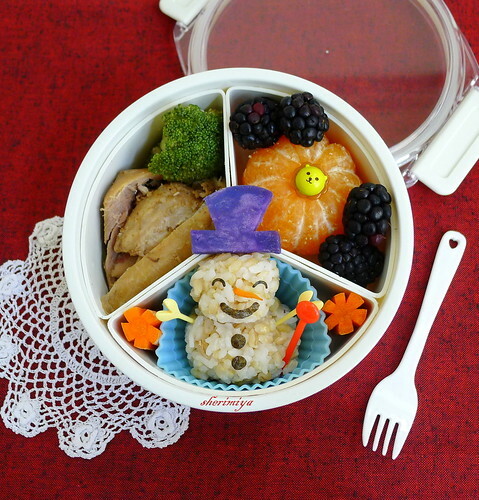 Snowman Onigiri Christmas Bento, a photo by sherimiya ♥ on Flickr. This is TinySprite's version of the comfort chicken and rice I made yesterday. I always pull her meat off the bone to save her lunchmates the sight of messy carnage. Plus, I can get more meat in the bento this way. 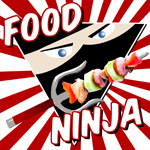 In one section there's chicken and broccoli; in the next a little two-ball onigiri snowman with nori detail and a steamed Okinawan sweet potato hat, some carrots; and finally a baby satsuma and a few blackberries. She also has a class snack party, so I don't expect her appetite to be all that big. I can tell my little girl is growing up when I look at her big brother's bento boxes and think: it may be time for her to use this one now. Yep, he has used this worn old three-sectioned box for years. It has kept all its pieces intact, and the latches, gasket and clear lid are all in great shape. What a workhorse! Love this one. Adorable lunch!! Yes, I too remember this super box of Misterman's, and you're still filling it with endless healthy inspiration for me! That's the most wonderful thing, thank you so much Sheri! So funny ! with the smiley !! the snowman is adorable ! a very good inpiration for me too ! !..see you soon ! I love your happy snowman. Oh squee! I love this cute snowman! Chicken and rice, you can't go wrong there! No indeed! Thank you Chantale!